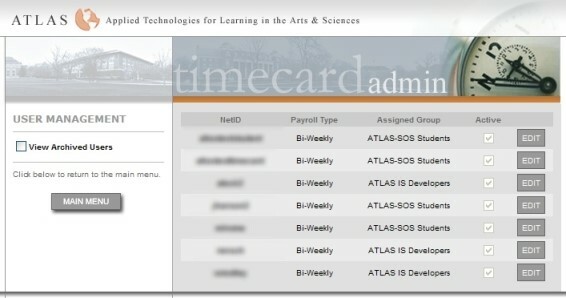 Detailed below are the instructions on how to do various features as an administrator in the ATLAS TimeCard app. These instructions are for users with administrator access to the app. If you have been granted administrator access and it seems like options are missing or that the app isn’t working, it may be a technical issue. 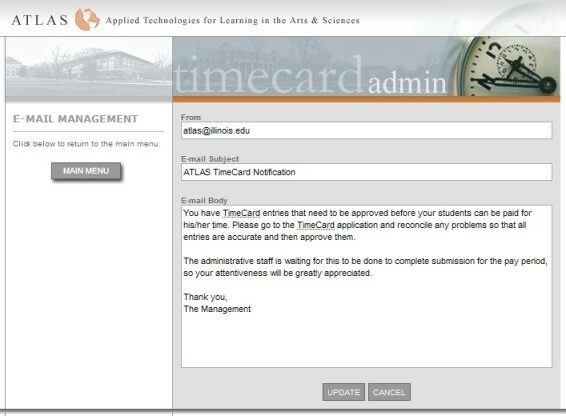 Email ATLAS at atlas-apps@illinois.edu for additional support if the guidelines below don’t answer your question(s). The system administrators are presented with an initial menu from which they can enter other administrative areas. Find the corresponding checkbox on the far right-hand column. Select the checkbox (there should now be a checkmark in the box). Send notification e-mails to managers who have employees with unapproved TimeCard entries. 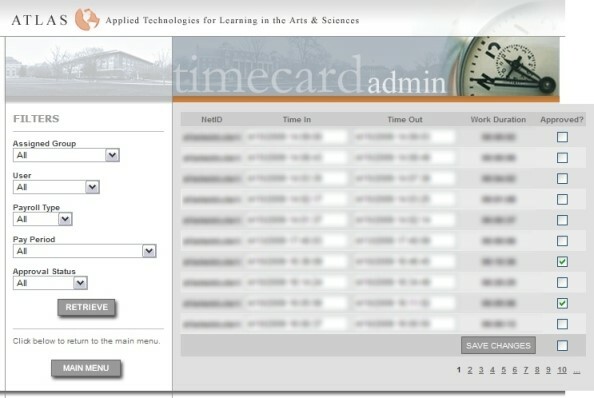 In addition, new users can be added through this interface in the form shown below. View, edit, and add groups in which employees will be added to. Set the Active status of the groups or remove the groups from the system entirely. To do either of these options, first locate the group you seek to edit. After locating it, click the Edit button located on the right half of the table. You can now alter the group name or change the active status. To change the name, highlight the name located in the text box, delete it and type your desired name. 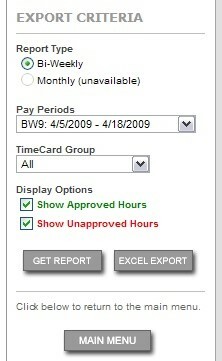 To change the active status, check or uncheck the box marked under the Active column. Once you’re satisfied with your changes, click the Save button. If you wish to delete the group, click the Delete button in the right most column of the table. If the group is selected for deletion, the system will check whether it has any dependencies. If it has dependencies, administrators will be able to re-assign those dependencies to another active group. Add or remove managers from each group. Set certain View/Edit/Approve permissions for each manager assigned to a specific group. To do either of these options, first locate the group you seek to edit. 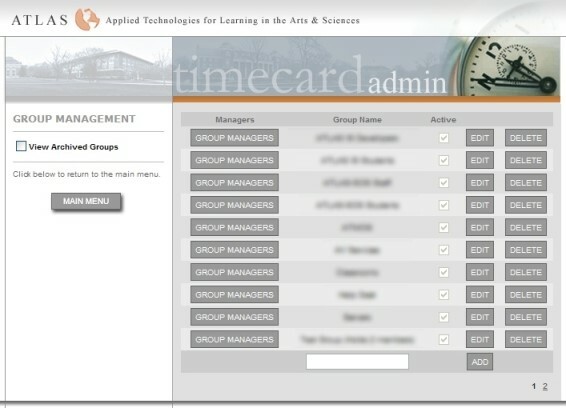 After locating it, click the Group Managers button to the left of it. A list of the group managers will appear. Next, locate the manager you want to edit. Click the Edit button, and then check or uncheck the permissions you want to give them. Click Save once you are satisfied with your changes. Alternatively, you can click the Delete button to remove them from the group altogether. Use the E-Mail Management interface to modify the format of e-mails sent to managers who have employees with unapproved TimeCards. Fill in a From address (________@website.com). Give the e-mail a descriptive Subject. Type the main message of e-mail in the E-mail Body. Click Update when finished or Cancel to cancel.